and yet one thing I never quite got around to was a post on my favourite game of the tournament. It's not that I didn't find the bamboozingly unclear messes of Conquest-Howell or Williams-Howell entertaining (both of which can be found here) but the game that I really liked was Keith Arkell's win against David Eggleston in round 10. Although at 2341 elo David Eggleston is a better player than virtually everybody in the country, by British Championship standards his rating places him in the ‘not-quite-premier-league’ category. He’s certainly no pushover, as he proved by defeating defending Champion Stuart Conquest in the very first round and then notching another GM Scalp by beating Danny Gormally the following day, but even so Arkell made Eggleston him look rather ordinary – and that at the end of a tournament that had seen Keith uncharacteristically out of sorts and punching somewhat below his weight. Is there anything special about this game? No, not at all, and that’s entirely the point. the game is obviously in White’s favour. His pieces are active, Black’s are passive; he has outposts on d5 and b6, Black has weak pawns on d6 and b7; his king is safe, Black’s might potentially get back rank mated (a factor that does not appear to have any immediate relevance although it turns out to be decisive). 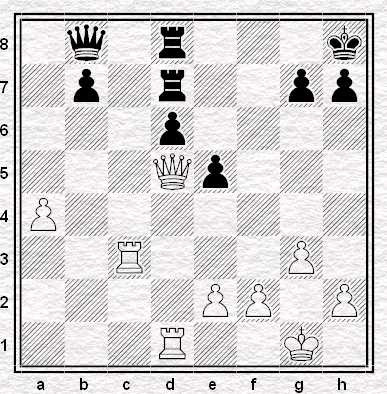 White’s advantage is so obvious you might think that a player of Eggleston’s strength would never have allowed the position to arise unless, perhaps, as the price he had to pay to fend off a mating attack or avoid losing material in complications which he’d miscalculated - except that having played through the game we already know this absolutely wasn’t the case. Arkell gave the impression of doing next to nothing and yet still managed to end up overwhelmingly on top. In the diagram position Black already has the advantage. The two bishops will give him a lasting edge in the endgame … it is not too difficult to convert to a win. I am certain that Rivas Pastor was fully aware of this but, somehow, he did not demonstrate the same ability as his opponent to manoeuvre pieces, and thus found himself in this unpleasant situation. Akopian, certainly, in no way calculated better than his opponent. 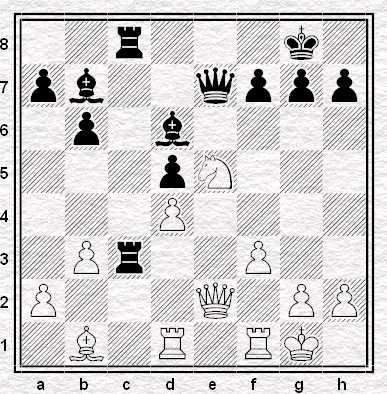 He had not foreseen all White’s moves, rather he was searching for optimum coordination between his pieces. If asked about the merits of White’s [play] Rivas Pastor would himself explain that White did nothing good for his position … But would he be able to suggest a good alternative plan for White? I do not believe so … Akopian would have suggestions, but Rivas Pastor would most likely not – at least not at the time the game was played because (I assume) he would have tried something else. is very likely what was going on in Arkell – Eggleston. In contrast to the David Howell games against Williams and Conquest there's not a single one of the 41 moves it took to secure the win that you or I couldn’t have found ourselves had we been in charge of the White pieces. The difference is that we, or at least I, wouldn’t be able to play 41 such moves in a row. To be able to do that takes the fundamental chess ability that anybody less than an Arkell lacks - even the 2300+ Eggleston it seems. Outplaying your opponent in almost unfathomable complications is one thing but doing nothing yet doing it so well that your opponent falls apart anyway is quite another. That a GM slayer can be reduced to rubble in such an apparently straightforward fashion is what makes Arkell-Eggleston truly impressive - and why it's my favourite game of the whole British Championship. If you look at the games of top GMs, they invariably play the Queen's Indian rather than the Bogo. This game is a good illustration of why. Funny you should mention that PG ... do pop back Friday.